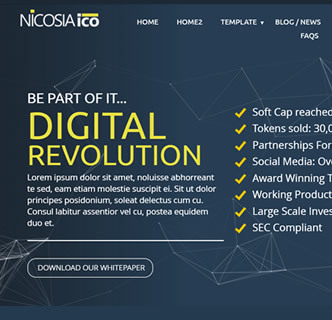 Looking to start your own ICO or website project, tryout this amazing new Joomla technology template. With all the features you expect to get your project started this website template will leave a professional touch with your visitors. This ICO/Technology style Joomla template features an excellent looking modern background style effect - as seen with many of the best ICOs. As well as this homepage effect there are also 2 navigation menu styles (click on the home2 page to see the hamburger menu in action). To make the most of this Joomla template avail of the stunning timeline/milestones module, which is easy to use and setup. Also with feature image slots available to use this is the ultra professional Joomla template to set your project apart from the competition. There are some built in options to select language buttons within the template manager screen, allowing you to link to a Chinese or other version of your website. Along with all the awesome effects this Joomla responsive provides it is a very easy to use Joomla template that looks great on all devices and is easy to use. There is no requirement for additional extensions or plugins. There are various social media buttons that be linked to your social media accounts - all from the template manager screen. Also there are Facebook and Twitter sharing options. This Joomla template comes with a Quickstart package installer, allowing you to easily create a copy of the demo with just a few clicks. A user manual is also provided - along with all the extensions used in this template.